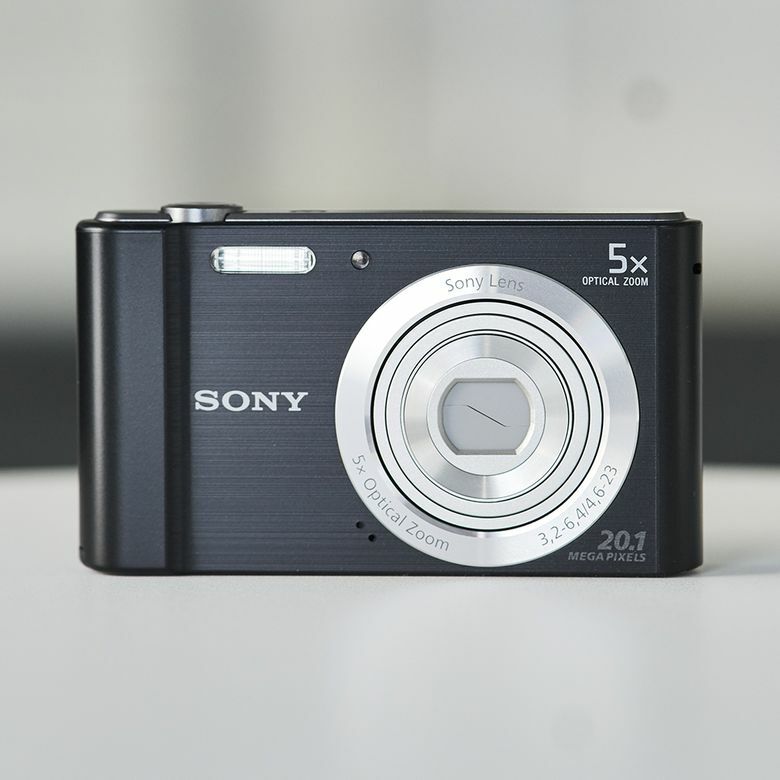 The Sony DSC-W800 is a functional entry-level camera featuring a surprisingly generous feature set. For under $100, it’s hard to expect more. Entry-level point-and-shoot cameras are often overlooked as an option for potential shoppers due to the abundance (and increasing quality) of smartphone cameras. Don’t be fooled, though: there are still plenty of features only accessible in a standalone camera, and those looking to take their first steps into the world of photography will appreciate getting access to those features for less than $100 with the Sony DSC-W800. It boasts a 20.1-megapixel sensor and 5x optical zoom lens, which mean you can, with a bit of patience, take great photos in a lot of conditions. Couple this with SteadyShot image stabilization, USB charging, and a simple-to-use 360-degree panorama mode, and Sony has put together an attractive package for beginners looking to get their toes wet. The Sony DSC-W800 features a highly pocketable design that takes away any excuse for not bringing it with you. Measuring 3.8 inches wide and 0.82 inches deep, and weighing a meager 4.2 ounces with battery and memory inside, it’s even lighter and smaller than most modern smartphones. The only downside to this featherweight design is that we found the camera to be a little flimsy feeling when handling it. It’s a forgivable tradeoff in our opinion, but certainly worthy of note. The buttons and controls, on the other hand, feel every bit as robust as we would hope for. The only weak point was the video recording button, which is somewhat awkwardly positioned and hard to press. One familiar drawback to such a size-conscious camera, of course, is that anyone with larger hands will have a tough time comfortably holding and operating it. While this may be tough for larger adults, it certainly makes it an ideal camera for children, who will benefit not only from the dimensions, but from the approachable controls and unthreatening price point. The Sony DSC-W800 certainly gets high marks on setup—we could barely hope for an easier setup process. The camera itself comes in a fairly tiny box containing only the bare essentials: a battery, a charger, and the camera itself. Both the battery and SD card fit inside a sliding compartment on the bottom of the camera body, and are fairly fool-proof, both built in such a way that you can’t insert either of them in the wrong direction. When initially setting up the camera, simply insert the battery and plug in the included cable into the only external port to start charging. The device contained enough of a charge out of the box to start using and testing out the camera right away, but your mileage may vary. Because the battery is small, the camera can reach a full charge very quickly, but this, of course, comes with the drawback of only being rated for 200 shots or 100 minutes of continuous usage. In our testing, this was adequate for short spurts but diligent charging was definitely required before taking it out to use. We’re not going to sugarcoat it: you are paying around $90 for a camera, and you are getting that level of photo quality. Buyers familiar with more recent camera alternatives costing three to 10 times as much might be a little unpleasantly surprised by the image quality. That having been said, with a little patience and the right equipment (we strongly recommend getting a tripod), you can certainly take good photos. As with most cameras on the lower end of the price spectrum, the Sony DSC-W800 will deliver much better results in conditions with plenty of light. Auto-focus lags in lower lighting conditions, and older sensor technology means that you will need to open the shutter for longer in moderate and dimly lighting situations. In plain English: Expect it to take 1 to 4 seconds to take a good photo indoors at night without using the flash. As with most cameras on the lower end of the price spectrum, the Sony DSC-W800 will deliver much better results in conditions with plenty of light. If you want blur-free photos, you will benefit greatly from a tripod, and a subject that isn’t moving. These constraints might seem a little cumbersome, but to be perfectly honest, they provide a path to learn important lessons for any photographer hoping to improve their competency with cameras. If you are willing to embrace the occasional difficulty as a learning opportunity, we think you’ll find the DSC-W800 to be a wonderful platform for growth. One final item of note: the 2.7 in (4:3) / 230,400 dots screen on the rear of the camera isn’t a very high resolution, and the photos you are taking with the camera will look a lot better when you take them off the camera and onto your computer. Like other cameras at this price point, video quality is a bit of an afterthought. A video recording resolution of 1280 x 720 falls short of full HD (1920 x 1080) and is difficult to recommend for anyone hoping to use this device primarily for video purposes. Those hoping to make the jump into video will be better served saving for a camera offering at least 1080p, if not 4K recording capabilities. That said, for those not shopping specifically for a video-capable shooter, the DSC-W800 will still provide enough of a platform to cover basic filming needs. When you first turn on the Sony DSC-W800 you will select your date, time, and location information, and then you’ll be ready to start taking photos. The menu system is straightforward to navigate, and relatively bare, but this simplicity also takes a lot of the guesswork out of using the device. One of the better features of the camera is the “Panorama Shot,” which provided more additional options than we expected, letting the user select the shooting direction (right, left, up, down) photo size (standard, wide, 360), and exposure compensation. Another feature that will benefit both young children and those that are easily encumbered by too many menu options is something Sony calls “Easy Mode”. Selecting this option strips away nearly all the menu options (leaving only still image size), enlarges all the font and icon sizes, and changes the information overlay to show only battery life, remaining shots left on storage, and whether or not the flash is currently enabled. For those that just want to jump in and start taking pictures right away without worrying about the various options at their disposal, this will be a nice perk. At under $100, the Sony DSC-W800 gives you everything you can reasonably expect to receive in a new camera at this price. You will be hard-pressed to find a cheaper alternative that is worth considering, so if spending more is really not an option, you don’t need to look too much further. You will be hard pressed to find a cheaper alternative that is worth considering. The only thing you need to consider at this point is if you need more out of a camera, enough to warrant increasing your budget or saving longer. The closest peer to the DSC-W800 in the scope of our testing considerations was the Canon PowerShot ELPH 190 IS, which sits at nearly double the cost at an MSRP of $159.99. Buyers opting for the Canon will enjoy features like a 10x optical zoom (double that of the Sony), and modern connectivity options like WiFi and NFC support, making it a more future-proof model to consider. In a shot-by-shot comparison, the Canon wins a lot more than it loses. Take a peek at some of the other best digital cameras under $200 you can buy. If budget is king in your purchasing decision, this is the camera for you. The Sony DSC-W800 delivers on enough features to make this camera worth considering in the first place, and for $89.99 that’s actually saying a lot in the camera world. Product Dimensions 2 x 2.1 x 0.9 in.